In People, in the folder pane, click the contact folder that you want to share with a person in your organization. Click Home. Then, in the Share group, click Share Contacts. In the To box, enter the name of the recipient for the sharing invitation message. If you want to, you can change the Subject. If you want to, request permission to view the recipient's default People folder. To do so, select the Request permission to view recipient's Contacts folder check box. Note: If you want to request access to a contacts folder other than the recipient’s default People folder, you must send an email message that asks for permissions to that particular folder. This option only requests access to the recipient's default People folder. In the message body, type any information that you want to include, and then click Send. Review the confirmation dialog box, and then if correct, click OK. 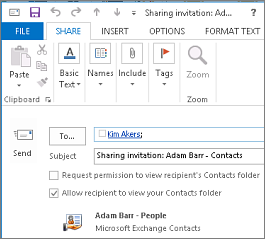 The person in your organization receives the sharing invitation in email, and clicks Open this Contacts folder. In People, in the folder pane, click the contact folder that you want to share with a person outside your organization. If the following error displays when you try to send the sharing invitation, sharing contacts with people outside of your organization is not supported by the sharing policy for your organization. Only an admin in your organization can change the sharing policy for your organization. For more information, see the end of this section. The person outside your organization receives the sharing invitation in email, and clicks Open this Contacts folder. If you receive an error when you try to share your contacts with someone outside your organization, contact the person that manages your email account. 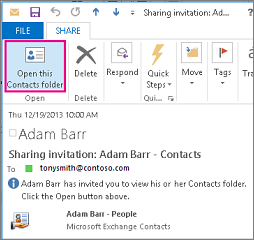 In People, in the folder pane, click Contacts. Click Folder. Then, in the Properties group, click Folder Permissions. In the Name box, click Default. Under Permissions, in the Permission Level list, click Publishing Editor or any of the other options. 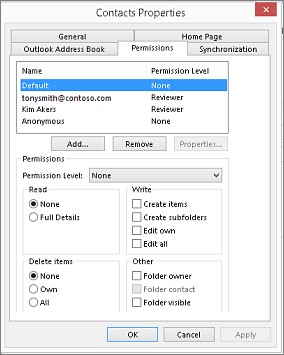 In People, in the Folder Pane, click the contacts folder for which you want to change permissions. Revoke or change access permissions for everyone In the Name box, click Default.. Under Permissions, in the Permission Level list, click None to revoke permissions or any of the other options to change permissions. Revoke or change access permissions for one person In the Name box, click the name of the person whose access permissions you want to change. Under Permissions, in the Permission Levellist, click None to revoke permissions or any of the other options to change permissions.